Six retired investigators, who helped determine the cause of the 1996 explosion of TWA Flight 800 over the Atlantic Ocean off of East Moriches, submitted a petition Wednesday to the National Transportation Safety Board to re-open an investigation into the crash. They did so with the help of a documentary filmmaker whose made-for-cable film about their doubts will air July 17 on the 17th anniversary of the crash. The documentary called “Flight 800,” will be aired on the third tier EPIX cable channel, which specializes in reruns of popular movies and championship boxing. The four-year long inquiry into the crash, the most extensive and expensive investigation in aviation history, had concluded that faulty wiring caused a spark to ignite the plane’s fuel tank. Speculation in the initial days after the accident revolved around a small radar blip, which may have been an unidentified fishing boat, near the plane at the time of the accident. Thirty-eight eyewitnesses said at the time of the crash they saw streaks of light heading toward the plane before it exploded, though inspectors concluded the flight, at more than 13,000 feet, was out of range of shoulder-operated missiles. The source of the radar blip was never identified. All 230 people on board died. “Of course, everyone knows about the eyewitness statements, but we also have corroborating information from the radar data, and the radar data shows a(n) asymmetric explosion coming out of that plane — something that didn’t happen in the official theory,” the film’s co-producer, Tom Stalcup, told CNN Wednesday. During the course of the investigation, which was done at the former Grumman plant in Calverton, there was frequent tension between the National Transportation Safety Board, which conducted the inquiry into the technical details of the crash, and the FBI, which was brought in to investigate a potential criminal case. The FBI closed its investigation within 16 months after concluding there was no criminal involvement in the crash. The investigators who filed the petition, all now retired, do not claim a missile shot down the plane, but they do detail moments in the investigation in which findings of explosive residue were brushed aside by the FBI and other investigators. 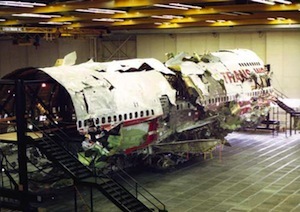 The presence of explosive residue received much press during the investigation, and had been linked at the time to either the use of the plane to transport soldiers returning from the first Gulf War in 1991 or to an explosive dog training exercise done in the plane one month before the crash. Investigators also believed at the time that the explosive residue could have been on the clothes of military personnel who participated in the recovery of the the airplane. What Are We Going to do with All These Leaves? A look at local media from that time might bring up some accounts I remember reading.